Junctions represent one of the most hazardous sections of UK roads. Statistically, most motorcycle accidents happen at or near junctions. Motorcycles are much more difficult to see than most other vehicles, particularly at junctions that are busy. Following safety routines is not only essential for passing the motorcycle riding test, but is an integral part of remaining as safe as possible throughout your riding career. In order to pass your motorcycle tests, you’ll need to be come proficient at all types of junctions, to gain an understanding of how they work and how to correctly judge other road users. 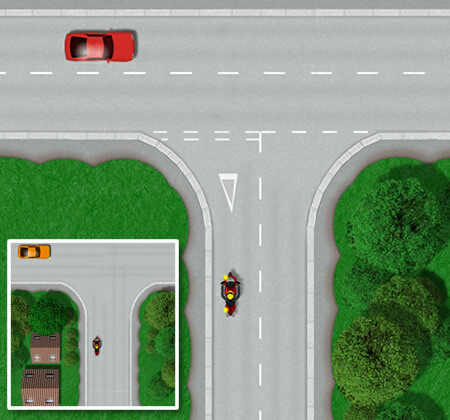 This section explains the various types of junctions you’ll encounter whilst learning to ride, emerging from junctions, making left and right turns, and routines that must be used in order to safely navigate the UK’s busy junctions. To start, let’s look at the various types of junctions you’ll encounter. 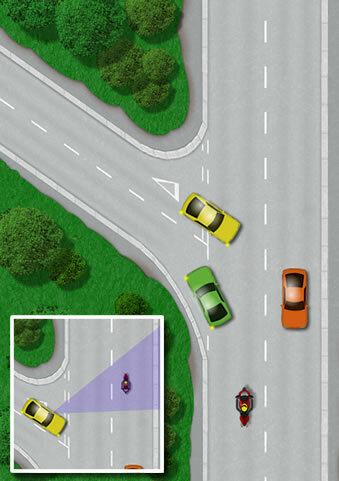 Detailed below are the various forms of junctions you’ll encounter whilst learning to ride. A T-junction is formed where a minor road ends to join a major road. T-junctions vary considerably by how they should be dealt with. Traffic lights – Priority is dictated by the traffic lights. These are called ‘controlled’ junctions. A ‘stop’ sign along with road markings – Often located at hazardous junctions, the regulatory ‘stop’ sign orders motorists to stop at the line before proceeding into the major road. These are called ‘marked’ junctions. A ‘give way’ sign along with road markings – Prepare to give way to traffic on the major road. Also called ‘marked’ junctions. ‘Give way’ road markings only – At junctions not too busy, give way road markings may only be used. Also called ‘marked’ junctions. No signs or road markings – At quiet junctions typically located in residential or rural areas, often no signs or road markings are used. At unmarked junctions, no one has priory. It’s essential you approach with caution and prepare to stop. These are called ‘unmarked’ junctions. Statistically, most motorcyclist accidents occur at or close to a junction. If you are riding on the major road, read the road well ahead and observe road signs. Be cautious of vehicles emerging from side roads who may not have seen you. Avoid overtaking on the approach to junctions. 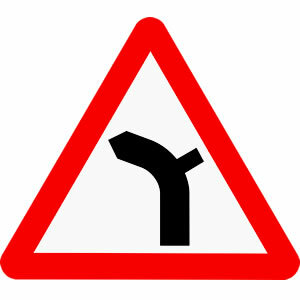 Y-junctions are essentially junctions (minor roads) to the left or right from a major road. The difference being, and the reason behind the name is the harsh angle that the minor roads take off of the major roads. 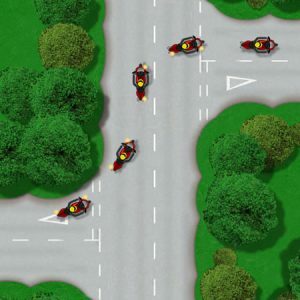 All junctions represent a particular hazard for motorcyclists. 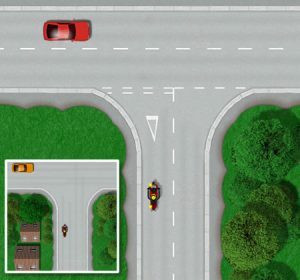 As can be seen in the diagram of the Y-junction, the yellow car is pulling out of the junction directly into the path of the motorcycle. Motorcycles are much harder to see due to their size and are easily obscured by other vehicles, such as the green car in the image. Keeping a safe following distance behind other vehicles will help other road users to see you. At staggered junctions, minor roads join the major road both from the right and left. Unlike a crossroads, the minor roads do not join the major road directly opposite each other and are slightly offset, hence the name staggered (See staggered junction image). If you are riding on the major road, look for advanced warning signs of the junction and be cautious of vehicles emerging from the minor roads. If you are riding on the minor roads and intend to cross one minor road to the other, emerge from one minor road into the centre of the major road when it’s safe to do so. Wait until you’re sure it’s safe then to proceed over to the opposite minor road. Remember that junctions may be unmarked, with no road markings or signs, especially in quiet residential and rural areas. Junctions on bends require extra caution. Vehicles emerging from the minor road onto the major road can do so with little warning due to the bend. Always look well ahead for advanced warning signs that a junction is located on a bend and prepare to slow down. These junctions are particularly hazardous when turning right from a major road that bends to the left due to your field of vision being limited. Road markings are typically located at junctions and can represent a hazard to motorcycle rider. When the roads are wet, road markings can become slippery. Avoid riding on these markings if and when possible. An essential part of learning junctions is the OSM PSL routine. Learning this system will help to ensure you correctly observe, signal, position and gain the appropriate speed at junctions.